Two-Gun Kid - travels through the 5th dimension!!! 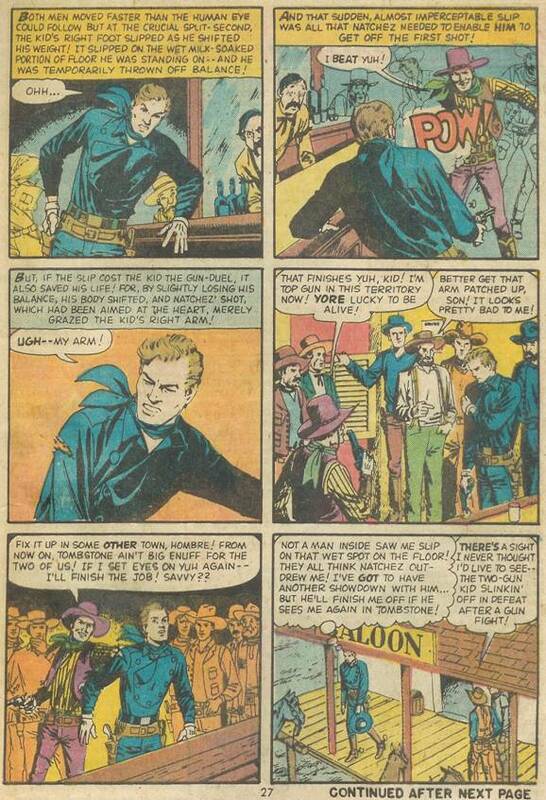 Like it or hate it, everybody knows about the Western genre. There’s the good guy and the bad guy who inevitably meet in a showdown in (usually but not always) the centre of town. It’s almost gladiatorial in nature how the townsfolk would peep out their shuttered windows to see who would win the battle to the death. 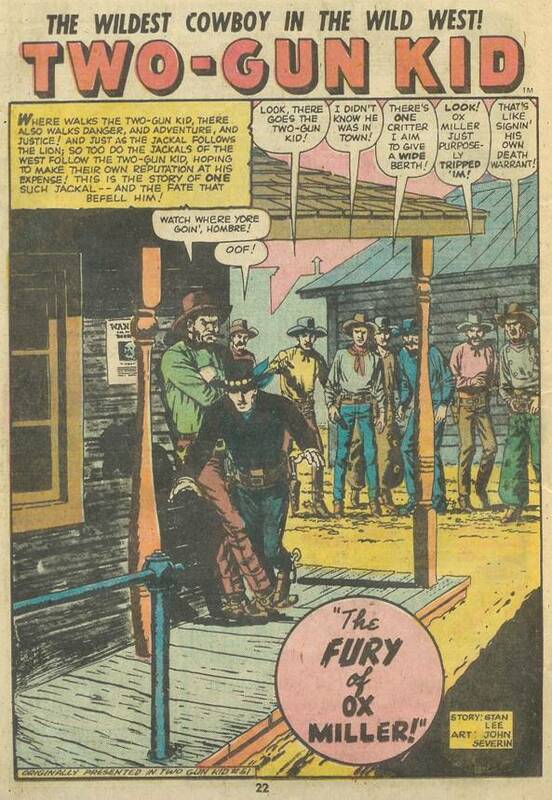 Of course in the era of stern comic censorship, this is limited to humiliating the opponent by disarming him and kicking him out of town or shipping him off to jail. A tried formula that still comes up today. Everybody loves a good showdown. How’s that for a freaky intro? Two-Gun was purposely tripped up by that big, sour faced looking fellow. It’s like Junior High all over again! Okay, tension is building here! Ox Miller has just challenged the Kid to a fight Manno-e-Manno! Will the Kid accept? 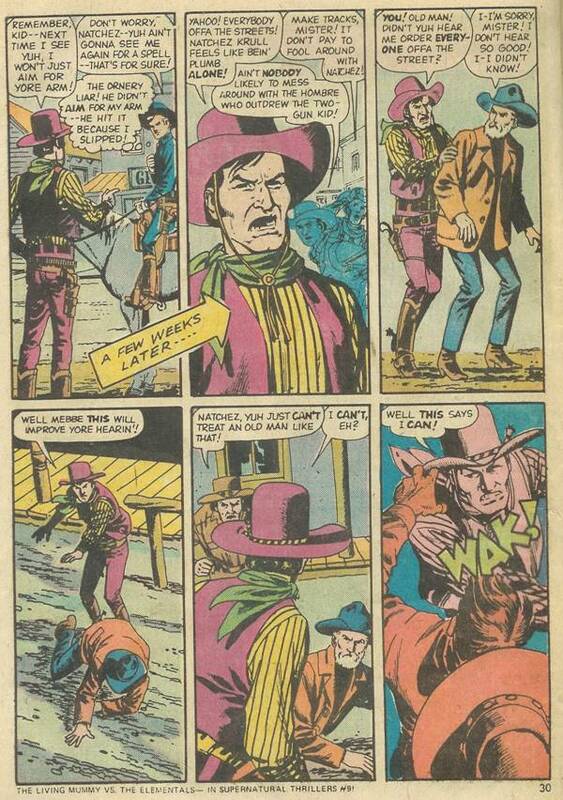 Funny point, don’t you just love how the background always changes in these old comics? First it’s yellow, then red, then Orange. I’m not even going to try and figure out the second last panel’s color scheme. Funky blue dirt though. …what the heck happened? Where the heck is Ox Miller? Who is this Natchez? Why are they now inside a saloon instead of outside? And what the heck is the Kid doing spilling milk all over the place??? I kid you not, the issue of Two-Gun Kid #120 I’ve got actually follows the story in this manner, I’m not changing books mid-entry here. It took me a while to figure out what was going on, but it appears a serious printing error occurred here. 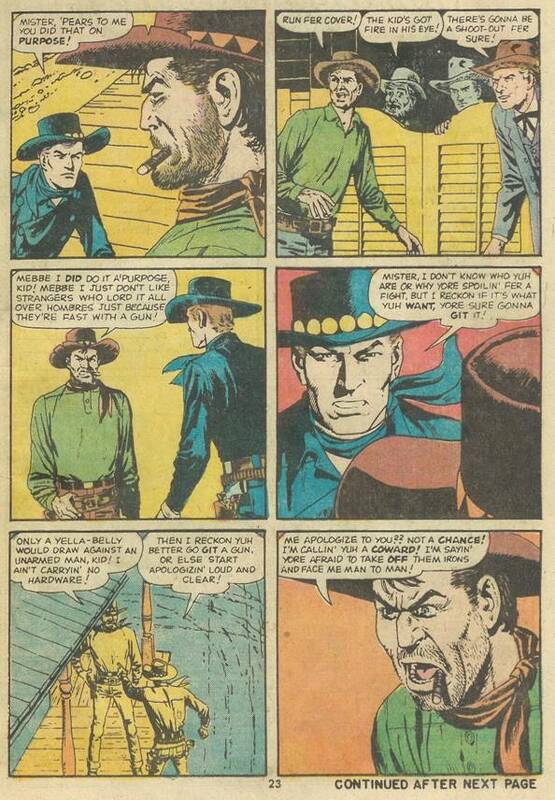 Makes me wonder if all issues of Two-Gun #120 are like this – and if so, it sure would explain why the book didn’t last much longer. Imagine subscribing to a comic book where in every issue the story’s beginning doesn’t match the end. Though it would make it an unpredictable series to read. I’m kind of ticked that I can’t find out what happened to Ox Miller, but what the heck. Let’s just pretend that the Kid just passed through into some bizarre alternate universe and that Ox is now Natchez (or as I like to call him, Nachos). He’s also one of the most Anglo looking Mexicans I’ve ever seen! 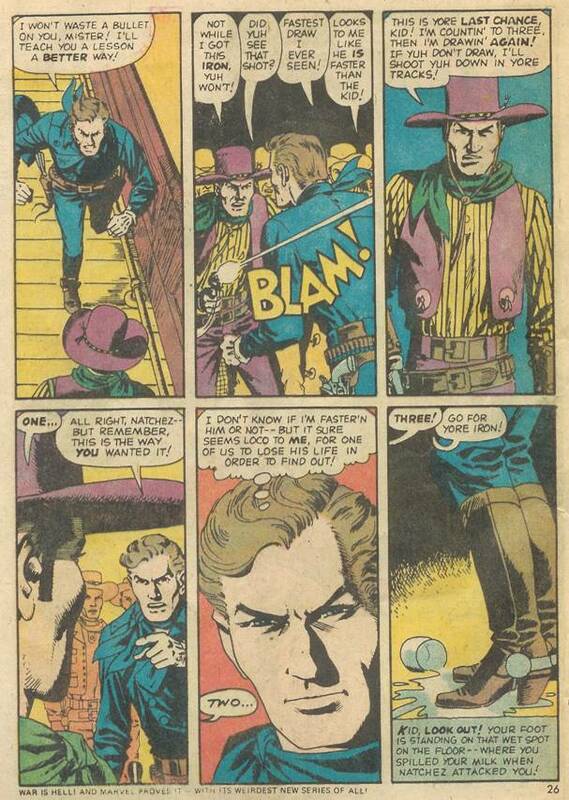 Ah, Two-Gun, fallen like so many other gunslingers to that bane of their profession, spilt milk! I’m surprised that good old Wyatt Earp didn’t shove him out of Tombstone years ago for being such a sissy drinker! Geez, doesn’t the Kid remember Shane and how he nearly got pummeled for ordering Sarsaparilla? Egad! Now Natchez Krull (I guess he’s part Mexican and part, what, Swedish?) has taken to slapping around old men! You’d think a guy with the run of the town would have better things to do with his time, like, say, I don’t know, getting all the money he can lay his hands on? Having a good time with the choicest of town whores? Smacking the guy who tries to stand up to him INSTEAD of the old man? Seriously, do his actions make sense here? 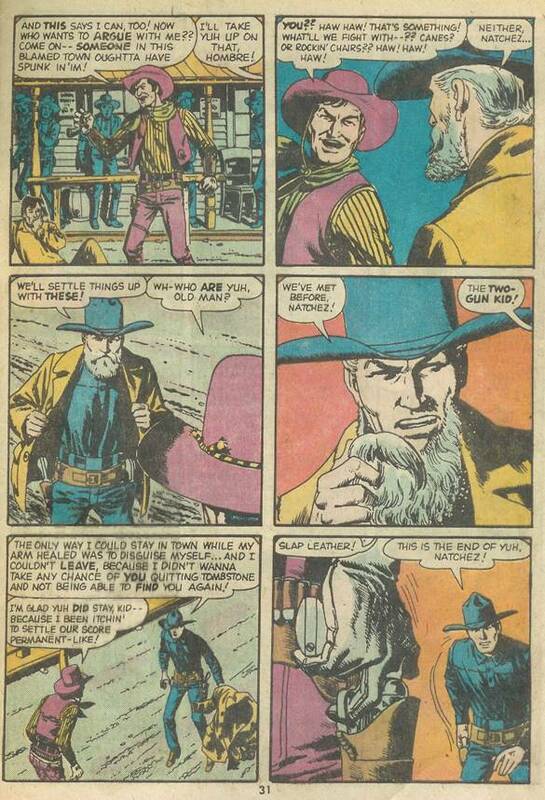 Oh my goodness… the old man was Two-Gun Kid! And apparently Natchez smacked around someone else – I think. Maybe it’s Ox Miller? The traditional showdown is at hand, what will become of our hero? 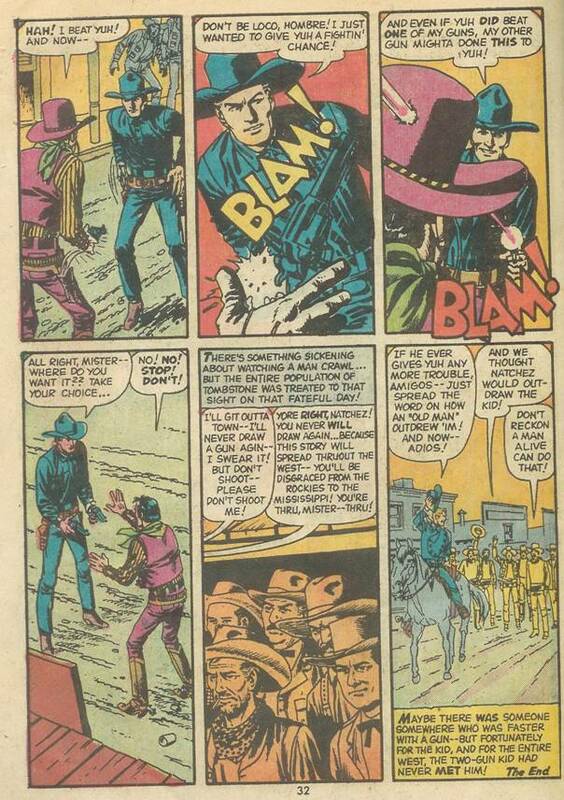 And so another right is wronged by the Two-Gun Kid, though I can’t really figure out what wrong he’s fixing here as the beginning of the story doesn’t match to the rest, but whatever. And hey, if you look closely you’ll notice on the third to last panel, next to Natchez’s left foot is an empty glass! Natchez, you fool, falling for the bane of all gunslingers everywhere, SPILLED MILK! Until next time, I reckon!